WHAT A GREAT "IDEA"! MAKING A LITTLE HISTORY WITH CLICK EFFECTS PRIME. Were you there? Did you make it to Philadelphia during that last, very hot month of July? It seemed like every representative from across the land was there. No, you can rest easy. I’m not about to launch into a history of the founding of America and its break for independence from Great Britain. This is, after all, a blog about live production technology. However, an august group of like-minded "revolutionaries" did gather last month in The City of Brotherly Love. I refer to them as revolutionaries because, in their "pursuit of happiness", they're committing themselves to the happiness of others. They came from every corner of the country, nearly every State represented. One representative from Japan was even spotted among the attendees. They gathered together out of common interest and one self-evident truth: They’re all fans. Fans of sport. Fans of live production technology that serves a singular purpose. To bring their fans together in united resolution, cheering their team on to victory at arenas and stadiums across the country. So there we were, nearly 600 strong gathered at the Sheraton Philadelphia Downtown, assembled in a large ballroom where IDEA members mingled among vendors who demonstrated their latest in-venue solutions during meals and networking breaks. ChyronHego made a little history as we debuted Click Effects PRIME, fresh off its official unveiling at NAB. Click Effects PRIME unites the advanced authoring, rendering, and data binding power of our PRIME graphics system with the industry-leading arena graphics generation and custom digital display control of the Click Effects CrossFire and Blaze solutions. I’m happy to say that the IDEA membership greeted Click Effects PRIME with high enthusiasm. Interest was so high that we were still giving demos during the booth breakdown! Now the leaders behind the IDEA Conference, who are phenomenally talented people by the way, are quick to point out that vendor booths are merely the backdrop for the larger conference. And they are right. IDEA is really about networking and developing relationships between members and technology solution providers. Throughout the conference-themed breakout sessions, which covered the professional development gamut from “How Your Game Ops Can Win the Internet” to “Plug It In, Plug It In”, part of the Graphics & Video track session, is where the learning happens among peers who share similar interests in bettering the fan experience. But the real action was experienced at the four off-site venues where everyone mingled amongst not only each other but enough live production technology to fill, well…an arena. Stadium and arena tours included Talon Energy Stadium, home field of the Philadelphia Union Soccer Club (Click Effects and Lyric pictured right), followed by visits to Wells Fargo Arena’s Philadelphia Flyers hockey and Sixers basketball, to Lincoln Financial Field’s National Football League’s Eagles, and final swing at Citizens Bank Ballpark hosted by the Philadelphia Phillies’ game operations crew. Did I mention that this was my first visit to an IDEA Conference? It was, for me, an extraordinary experience. 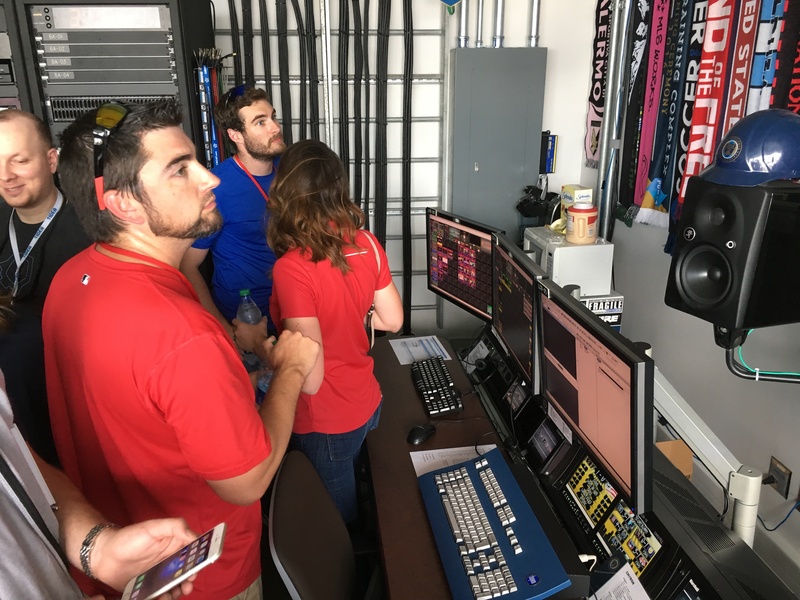 If you’re lucky enough to be working at any level within the live venue production segment, whether you work in the venue’s control room or provide the technology that drives fan engagement, you know the passion that exists among those who occupy a game-day seat. At ChyronHego, we live for game day. 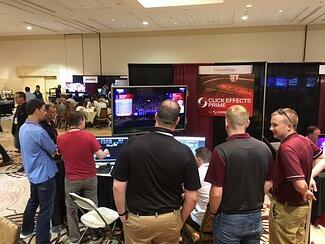 And our solutions, including Click Effects PRIME, are revolutionizing live presentations in venues around the globe. This latest, market-leading solution includes a dynamic feature set for digital signage and LED control. A versatile real-time 3D engine that offers designers a full toolset of shaders, lights, materials, video texturing and more, up to 12 DVI Players, expanded output resolutions, and groundbreaking TRACAB integration are but a few of the tantalizing options available to you now with Click Effects PRIME. Click Effects PRIME's powerful CG authoring and design tools are propelling in-stadium display to broadcast-quality experiences, and is allowing for many of the effects that fans are accustomed to seeing on TV to be shown on LED screens in stadiums and arenas around the world. All still one simple click away with the Click Effects user interface! IDEA 2018 will be held in Indianapolis next July 8th through July 11th. Mark you calendar and make plans to attend! You can bet ChyronHego will be there. But you don’t have to wait until next year to see all that Click Effects PRIME offers your next game-day live presentation. 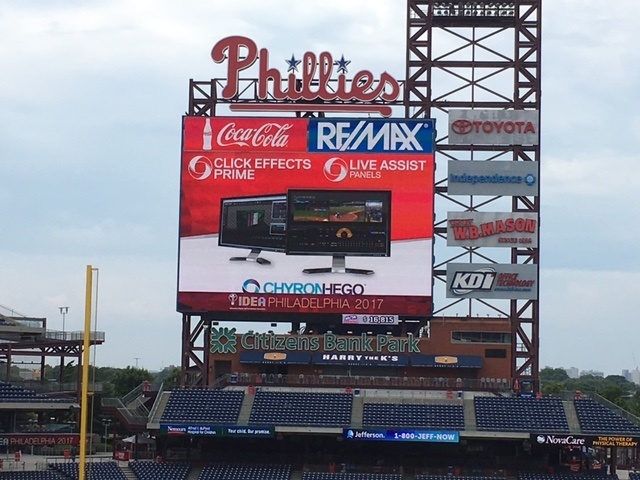 Click Effects PRIME headlines ChyronHego’s sponsorship at SVGEurope’s Sports Production Summit, and it occupies a prominent space on the ChyronHego stand at IBC 2017 this September. Not attending either of those two Amsterdam-based events? No worries! You can learn more and schedule your demo today by clicking the image below.